Adults interested in volunteering in the Cancer Center can call 315-464-5180 or visit the Volunteers website. Volunteers are needed daytime from Monday to Friday, to assist patients in the infusion areas and to staff a "Comfort Cart." The gesture may seem small, but for the cancer patient who feels chilly during infusion, the offer of a warm blanket provides much more than creature comfort. 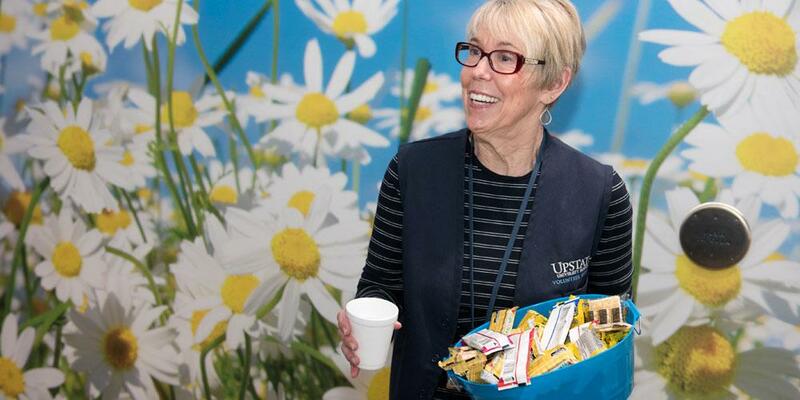 Cancer Center volunteer, Linda Bigsby, pictured above, distributes drinks and snacks in the infusion areas of the Upstate Cancer Center. "I do the simplest of things, but people are so appreciative," says Bigsby. After retiring from a career as a nurse, Bigsby found time to give back to her community. Bigsby offers snacks if a patient is hungry, magazines if he or she wants to read, companionship if he or she is alone. She says she has learned to tell when people wish to be left alone, and when they want company. Volunteers from the cancer center go through the American Cancer Society's Cancer Resource Volunteer program so they are familiar with the resources available from the society. That way, as the volunteers get to know patients, they will be able to suggest appropriate programs and services that might be helpful, along with the creature comforts they provide. Last Modified: December 26, 2018. Contact Casaundra Hildreth with questions about the content of this page.